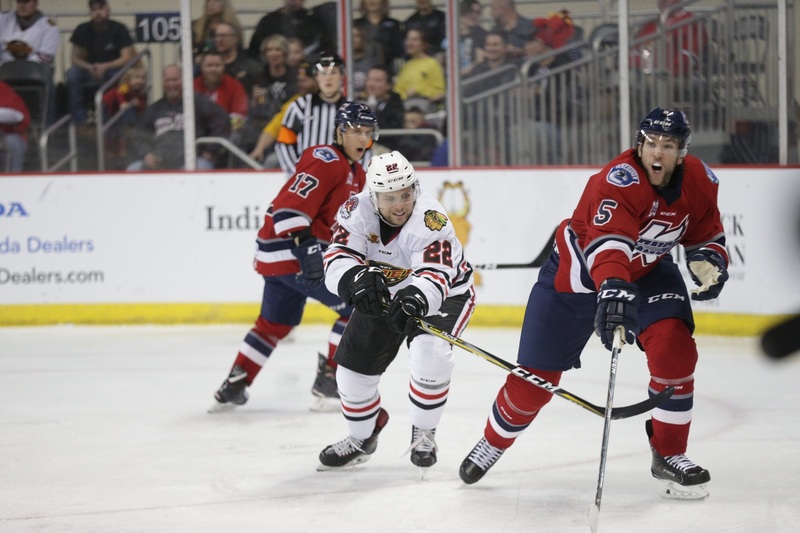 The Indy Fuel returned to home ice for the first time in nearly two weeks. It was a familiar foe in this game as Indy once against hosted the Kalamazoo Wings. The two teams were separated by just one point in the central division standings coming into the game. The Fuel could not hold the Wings off and dropped one point behind Kalamazoo after the 4-2 defeat. The Wings got the scoring started early. Just 31 seconds into the game, Michael Neal beat Matt Tomkins to put Kalamazoo up 1-0. The Fuel struggled to get much time in their offensive zone. A Wings penalty helped that problem and Josh Shalla capitalized with his 19th goal of the season to tie the game at 1. After that goal, both teams started playing physically and frantically. Neither team found the back of the net for the rest of the period, but the action wasn’t over after the horn. The two teams got into a scrum after the period ended and the referees had to come in and break it up. Both teams received penalties. In his first game back with the Fuel since late December, Olivier Labelle sat in the penalty box for cross-checking along with the Wings’ Ben Wilson for roughing. The Fuel’s penalty killing continued its hot streak, killing off two more penalties during the period. The Fuel put pressure on Wings netminder Jake Hildebrand early, with five shots in the first three minutes, but managed just two for the rest of the period. With just over five minutes left in the frame, Kalamazoo’s Brendan Bradley broke the tie with his fourth goal of the season. Indy went to the locker room down 2-1. The Wings controlled the pace early in the final frame as the Fuel struggled to get quality looks at the net. Kalamazoo’s Matt Joyaux took a penalty for interference and a second after the man advantage expired, Mathew Thompson found the back of the net to knot the score back up at 2. The goal was Thompson’s 12th of the season. Just about five minutes later, the Wings’ Kyle Thomas put his team up for good with his 12th goal of the season. Reid Gardiner added the extra tally for Kalamazoo and the Fuel drop this one 4-2. The Fuel travel to take on the second place Toledo Walleye. Indy is 2-2-0-0 against Toledo this season. The puck drops at 7:15 pm ET on February 9.